Ms. Allender grew up in Pleasanton and is an alumna of Foothill High School. Remembering from young age when she would pretend to be a teacher to her stuffed animals, Ms. Allender always had a heart for children. Desiring a career where she could couple her passion for educating and serving her community, it was no surprise when she formally pursued her teaching career. Graduating with her Bachelor’s Degree in Liberal Studies and received her minor in Child Development from Cal State East Bay, Ms. Allender earned her Multiple Subject Teaching Credential at Saint Mary’s College of California. It was during her course studies that she had the opportunity to visit different school systems and witness the power of positive instruction. Continuing her love for teaching, Miss Allender was hired in the San Ramon District where she has happily been working at a 5th grade teacher. When Ms. Allender is not teaching, she enjoys being outdoors, working out, and spending time with family and friends. One passion of hers is traveling and getting a personal account of cultures and the experience that come with diversity. 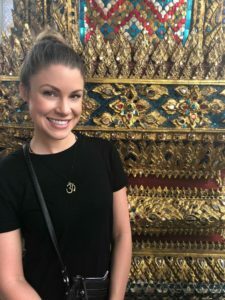 Having traveled to Barcelona, Paris, Ibiza, Amsterdam and explored the wonders of Thailand, Ms. Allender is global traveler. Most recently, her travels had her venturing through the East Coast, including Boston, where she was able to spend the 4thof July walking the Freedom Trail and learning more about the American Revolution. A historian at heart with a love for all things English, she is excited to bring her knowledge, enthusiasm and joy to her classroom at Mill Creek Academy.